West Coast Expeditions is in a league by itself. We want you to be comfortable so that you can appreciate where you are and what you're doing. We work together with our guests to sensibly manage safety-related decisions so that we can maximize everyone's enjoyment. Guests regularly comment about how much they've appreciated the West Coast Expeditions team! We have a new appreciation for the true meaning of the word guide... you exemplified the profession. We love sharing our passion for sea kayaking, the local cultural and natural diversity, delicious meals, and balanced days filled with laughter and quiet moments. If you're not feeling safe and cared for, you're not having fun and absorbing what the area offers. We take care of the logistics and behind-the-scenes details that help you to fully relax and be absorbed in your holiday, savouring the remote wilderness of your base camp kayaking or expedition kayaking experience on the west coast Vancouver Island. In January 2016 we were honoured to receive the "Employee's Choice Award" in the Comox Valley Chamber of Commerce Community Awards, and were shortlisted as finalists for the Small Business of the Year Award. Learn about our history - we've has been doing personalized wilderness adventures in Kyuquot since 1972! David Pinel, managing owner and lead guide, has been playing in salty water all of his life. He has been kayaking, boating, and leading west coast marine adventures since 1985, and organizing personal adventures long before that. 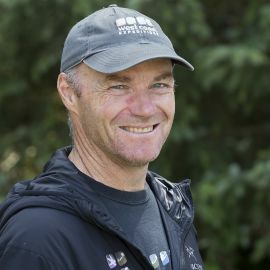 Since joining West Coast Expeditions in the mid-90's, guests have long appreciated Dave's dynamic, inspiring, and intuitive leadership style that weaves together the finer details while keeping the big picture in mind. Dave is an honorary member of the Ka:'yu:'k't'h'/Che:k:tles7et'h' First Nations through adoption into 2 families. He spent much of his childhood on lakes in Ontario or immersed in the Atlantic ocean. He fell in love with the Pacific coast as both a student and faculty at Lester B. Pearson United World College (Victoria, BC) and while working in fast-response Coast Guard Search & Rescue for five summer seasons. Dave established and helped grow one of Canada’s first comprehensive sea kayaking instructional centres at Ocean River Sports in Victoria. Occasionally lured away from Vancouver Island, his international travel and studies have taken him to India, Sweden, Norway, New Zealand, Australia, Western Europe, Mexico, Peru, and Ecuador. ...nobody else has been leading kayak tours there as long. No other paddler knows the area, its weather, and its people, as well as he does. Alex Matthews author of "Sea Kayaking: Rough Waters"
Dave coordinates and instructs the Adventure Guiding (since 2002) and Aboriginal Ecotourism (since 2014) programs for North Island College on Vancouver Island and has a passionate interest in coastal ecology and culture. Among kayakers, his knowledge of the Kyuquot area and community is unmatched - he loves sharing this with guests. His 1998 M.Sc. thesis (U. of Guelph) and later consulting work have contributed to community and economic development in the remote coastal area of Kyuquot. 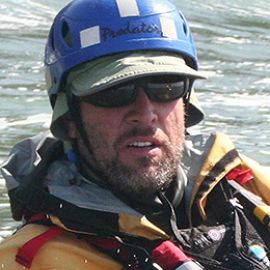 Dave is a veteran Guide Trainer and Examiner with the Sea Kayak Guides Alliance of BC, and has been an early and long-time contributor to shaping British Columbia's professional sea kayaking practices. Committed to marine stewardship, he is honoured to be a Lifetime Member of the Georgia Strait Alliance after serving as a Director from 1998 to 2004, including 4 years as President. He was a volunteer Director with the Wilderness Tourism Association of BC from 2012-2018, and is the Volunteer Warden of Checleset Bay Ecological Reserve - BC's largest marine ER. 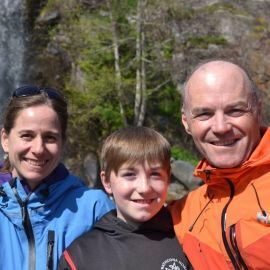 Together with wife Caroline, son Morgan, and the rest of our West Coast Expeditions team, he eagerly anticipates each summer, hosting you and sharing the joy and magic of Spring Island and the Kyuquot area. Despite all this serious stuff, he can let his hair down (oops, he doesn’t have any). Caroline Fisher, owner, cameo guide, guest services, office angel, and camp host...she loves plying the water in kayaks, exploring beaches and forests, eating well, and laughing. She has been a leader in outdoor education since 1990 and has extensive experience travelling and working internationally in South Africa, Mexico, Central America, New Zealand, and the United States (Four Corners region). Relatively recent forays have also included guiding mothership-based tours in Vietnam and Croatia. Caroline is an honorary member of the Ka:'yu:'k't'h'/Che:k:tles7et'h' First Nations through adoption into 2 families. 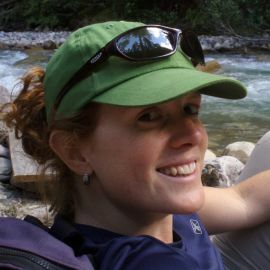 A self-professed “ecotourism geek”, she has grown and shared her passion for Responsible Travel at several international conferences and as Faculty with the Capilano University Outdoor Recreation Diploma and Wilderness Leadership Program, and more recently with the North Island College Adventure Tourism Programs. Her Bachelor of Tourism Management degree (Vancouver Island University) has led to some consulting in community-based tourism planning, including for coastal First Nations and the sea kayaking industry, and work with strategic planning for the Wilderness Tourism Association. Passionate about the coast and the health of our coastal ecosystems, she was a volunteer Director with the Georgia Strait Alliance for two years. After many seasons of kayak guiding with top companies in Clayoquot Sound and Johnstone Strait, our Kyuquot location became her “chosen place”! 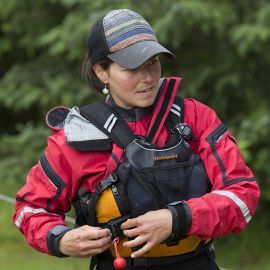 An experienced Level 3 Guide with the Sea Kayak Guides Alliance of BC for 6 years, she now maintains her Level 2 Certification. Caroline brings lively energy and a keen sense of fun and humour to our West Coast Expeditions family. Caroline juggles many of the behind-the-scenes administrative and operational details, guides when able, and skillfully pursues her love of healthy eating and delicious food as co-choreographer of our menu and meals. Morgan Fisher Pinel is an old soul who comes from the sea, and loves bumpy boat rides and paddling.Morgan is an honorary member of the Ka:'yu:'k't'h'/Che:k:tles7et'h' First Nations through adoption into 2 families. Aptly described in his early years by one of our long-time guests as a “little heart thief”, he ensures that everyone feels welcome while on Spring Island - adults and kids alike. Given the chance, he will take your hand or beckon you to the beach to see the little things, hear the owls and sea otters, and be a kid...or a now a tween....and often beyond his years. Morgan aptly leads forest walks and intertidal explorations, and gets into or out on the water whenever possible. Maybe he'll invite you swimming on a warm afternoon?! He can answer most of your questions, and if not, knows who can. He offers the most comprehensive camp tours, and loves having Spring Island as a second home, having logged over 90 weeks out here in his first 11 summers! Bev Michel, co-owner, is an Indigenous woman with a love and respect for the ocean and nature, as taught by her late dad, Michael Hansen and her mom, Hilda Hansen, one of only a few remaining Ka:'yu:'k't'h Elders (now 95!) from her generation. 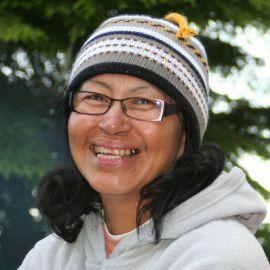 Bev has diverse talents and a smile that will make you feel welcome in her home territory of the Ka:'yu:'k't'h / Che:k:tles7et'h' (Kyuquot/Checleset) First Nations. Her cultural knowledge about the cedar tree and traditional weaving techniques is only part of what she shares. Bev is a trained Assistant Guide through North Island College's Adventure Tourism Certificate, and an experienced west coast boater. She has a dual degree in Tourism and Hospitality Management (Vancouver Island University), which included a study experience in Ghana, and is currently completing her Limited Masters ticket (big boats!). When she's able to join us on Spring Island, our guests appreciate Bev's comfortable, unassuming, knowledgeable, curious, and helpful nature. She loves being on the water, learning about and sharing her home place. Before West Coast Expeditions and tourism, Bev worked for years in First Nations administration, including as a band manager, bookkeeper, and economic development coordinator. Sarah Osberg, a top-tier lead guide, loves adventure, fun and the open coast. She was taught wilderness camping and ocean travel from an early age in open freighter cedar canvas canoes, along BC's coast, getting to know the giant cedars, thick step mosses, gangly cormorants, and oddities of sea stars. 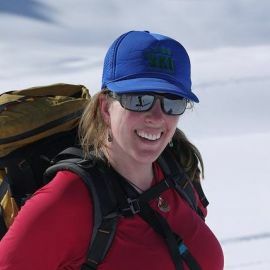 Sarah is an instructor and full-time faculty in the Adventure Studies Department at Thompson Rivers University, where she finds as much time as possible to explore mountain or ocean wilderness settings. and National Outdoor Leadership School (NOLS). She has an undergraduate degree in Education and a Masters degree in Outdoor, Environmental and Sustainability Education. There is always more to learn and share! 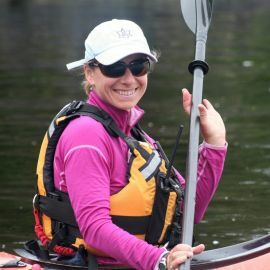 Having taught at the Kyuquot Elementary and Secondary School in 2013/14, she is thrilled to continue her connection with the Kyuquot people and area through WCE, guiding in what she considers one of the most beautiful places for kayaking and coastal living - the world just south of the Brooks Peninsula! With West Coast Expeditions guests, Sarah always looks forward to sharing a love of self-propelled travel, competencies with outdoor skills, and admiring the natural world while learning new things every day. Rowan Jones-Pardy, guide-wise-beyond-his-age, has grown up on the west coast and paddled with his family in many places across Canada. Legend has it that he started learning to paddle before walking. Many of his trips have been here on the coast of B.C. exploring from Victoria to the Brooks Peninsula in the Kyuquot area. He has an instilled love and comfort in the outdoors and on the ocean, so is a great resource for folks learning about our coast through kayaking. Rowan is a Level 3 kayak guide through the SKGABC and Level 1 Kayak Instructor with Paddle Canada. Guests of all ages appreciate Rowan's manner. When not on Spring Island, he has logged travels in New Zealand, Central America, and Western Europe. Outside of studies at Camosun College in Victoria, he wants to keep seeing more of the world, paddling and guiding in new waters. Monique Cudbertson, new to the helm of our guests' culinary experiences but a seasoned veteran at what she does, is a passionate chef, entrepreneur and artist. Growing up in the Canadian Rockies encouraged Monique’s adventurous spirit, and inspired her to explore the natural world. Monique found a way to blend her passion for good food and the outdoors with backcountry cooking. Her love for outdoor activities, exploring nature, and cooking has brought her to remote locations all over the province of British Columbia, and exotic locations worldwide. Mo is thrilled to be tasting the coast as a new setting, while pursuing her many talents with food and people. We are stoked to have her as part of our team! Lana Jules, cultural host, prepares our traditional Indigenous salmon feasts and evenings of cultural sharing. Lana, born and raised in Kyuquot, loves meeting our guests from across Canada and around the world. 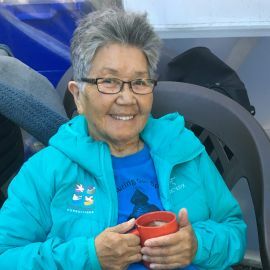 She's often accompanied by up to 4 generations of family and friends from Kyuquot, all who love the distinct and unique Canadian experience of cultural sharing while feasting on fresh salmon and halibut around a fire, on an island adjacent to where the fish was caught! Lana loves her home, and is a big part of welcoming all of our guests to this magnificent territory. 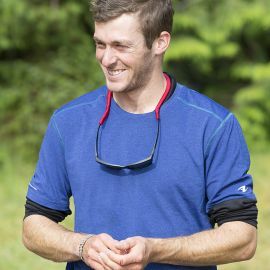 Michael Pardy, lead guide extraordinaire, is a modern pioneer in paddlesport and leadership development. Though somewhat abusive to his own kayaks (he can’t stop himself from exploring close to the rocks), he will help you to paddle with comfort while fully experiencing the coast and finding new boundaries and delights. His path has included guiding with Blackfeather Adventures in the Arctic, developing Ocean River Sports' Adventure Centre, co-founding and running Sea Kayak Instruction and Leadership Systems (SKILS), and as Executive Director of the Trade Association of Paddle Sports (TAPS). Moss doesn't grow on Michael (just a beard). 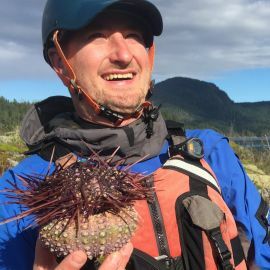 He is a faculty member at Royal Roads University, Camosun College (Adventure Education), and a Level 3 Guide and Examiner with the Sea Kayak Guides Alliance of BC and Instructor Trainer with Paddle Canada. Peter Wainwright, returning for his 3rd season with us as one of our Level 3 lead guides, is one of those rare all-round mountain and ocean guides who follows the seasons from sunny sea level stuff to snowy high elevations! Calm and highly capable, Peter inspires confidence while exploring rugged coastlines by kayak or on foot. Well-travelled, an accomplished paddler (BCU Star 5 Sea Kayak Leader and SKGABC Level 3 Guide), engineer by training, and conservation-inclined makes him interesting company across a spectrum of topics and experiences! We’re very grateful to have him on our team! Graham Vaughan, international man of mystery and veteran Level 3 lead guide, is in his happy place on the water sharing his vast knowledge and love of the ocean and its critters. 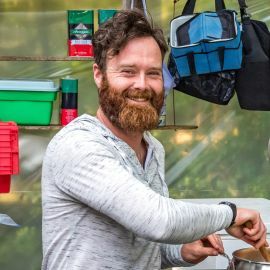 Graham is a graduate from Capilano University's Wilderness Leadership Program and now instructs as faculty with North Island College's Adventure Guiding Certificate, and Thompson River University's Adventure Studies programs. 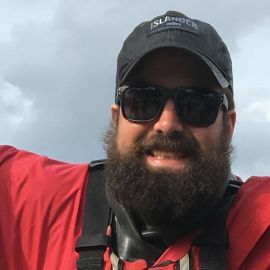 As a Level 2 Instructor with Paddle Canada, and an Examiner, Guide Trainer, and volunteer Director with the Sea Kayak Guides Alliance of BC, Graham is committed to ensuring that guided sea kayaking experiences are top-notch. He is passionate about marine education and conservation, and is currently pursuing that through a Masters degree program at Royal Roads University. Graham has paddled the BC coast to Alaska, and is always scheming his next adventure with friends! Russell Henry, energizer-guide, was born into paddling. His enthusiasm on and off the water draws you into loving what you're doing and where you are. With many long-distance paddling expeditions and multi-day speed accomplishments under his belt, he slows down very well to the leisure of introducing and exploring the intricacies of the Mission Group area on Spring Island's doorstep. 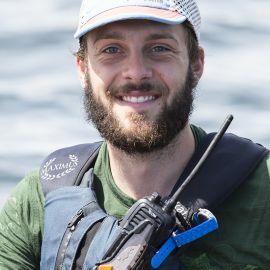 Russell is a graduate of the Thompson Rivers University Adventure Guiding Certificate, and is a Level 2 Guide with the Sea Kayak Guides Alliance of BC. Outside of West Coast Expeditions, Russell specializes in youth and family adventures through Camp Thunderbird (YMCA) and Strathcona Park Lodge, and is otherwise focused on engaging young people in active lifestyles. He's currently in training to become a paramedic in the BC Ambulance Service, which is perfect for his quick mind. Christine 'Chris' Jules, a Ka:'yu:'k't'h (Kyuquot First Nation) matriarch, keeps life in great perspective! She is constantly giving to those around her - including West Coast Expeditions staff and guests. Chris, her late husband Victor, and her immediate and extended family have long blessed our lives and guests' experiences on Spring Island with delicious salmon feasts on our 5 and 6-day base camp packages. She is full of laughter, personal stories, and sincere reflection. Chris is part of our family and team - a piece of the West Coast Expeditions fabric since 1992! 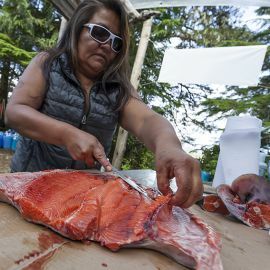 Her daughters Lana and Kathy, together with their children, have been rising to the occasion as the 'next generation' continuing the salmon feasts with our guests on Spring Island. Chris continues to join us whenever able - it's always a great gathering! Ryan Sabbas, assistant guide, is from Kyuquot and appreciates learning more about and sharing his home territory with guests. His infectiously happy and helpful energy makes for great company on land and water. 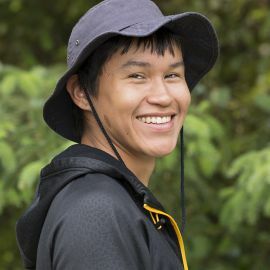 Ryan is a graduate of the Aboriginal Ecotourism Training Program through a partnership between North Island College, Vancouver Island University, and the Heiltsuk Tribal Council. He is part of a young generation of Indigenous guides who are embracing their cultural heritage while refining professional guiding skills as wilderness leaders. He also thinks he's funny, and usually is! 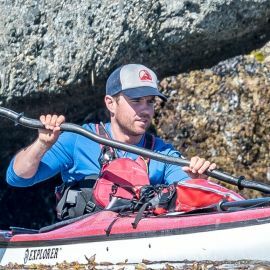 Going into his 4th season with WCE, Ryan is certified and experienced as an Assistant Overnight Guide through the Sea Kayak Guides Alliance of BC. Hanna Bohm, camp assistant, hails from Winnipeg and is otherwise studying Marine Biology at the University of Victoria. She's a water baby, and happiest in, on, under, or beside the ocean. 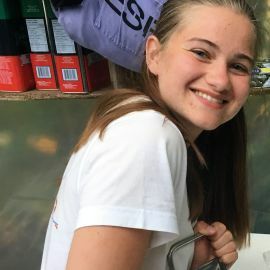 Hanna skillfully and cheerfully takes care of all the little behind-the-scenes details in camp, including the more obvious and never ending pile of dishes. She joins groups and assists guests on the water whenever able, and is passionately immersed in learning more about the west coast. Kellan Thorlakson, assistant guide, is a recent graduate of the Adventure Guiding Certificate at North Island College (NIC). Kellan decided to pursue guiding after returning from personal travels: he realized there were so many incredible places in his backyard (the west coast of Canada) to get to know and share with others...like Kyuquot! 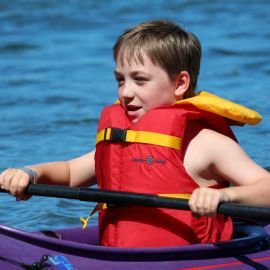 He's pumped about the summer season, and primed to keep building on his training from NIC, and recent Assistant Overnight Guide certification through the Sea Kayak Guides Alliance of BC. Kellan is thoughtful, observant, and a hard worker - usually the first one up and the last to bed, wanting to ensure that all details are taken care of so that the next day is ready to go! He likes to help wherever he can, be it on the water, at camp, or in the kitchen - you can always find him lending a hand. Even though it can be hard to tell, as evidenced by this photo, under his bushy beard there is always a smile! Staff-at-Large, who join us when able! Adrienne Daniel kept our office flowing for 4 years, managing our guest communications and travel logistics; she's now pursuing a great new administrative position with our local school district, and on-call to assist WCE as needed. She's another smiling face who is happy helping you to prepare for a relaxing and unforgettable adventure! Adrienne is passionate about ecotourism, so has been thrilled to help support and refine our sustainable practices. A current Bachelor of Business Administration student with North Island College and graduate of the Adventure Tourism Business Operations Diploma program from College of the Rockies, Adrienne has also achieved a certificate in Community Leadership from the Centre for Innovative Entrepreneur Leaders. Adrienne is a nature lover at heart. As a previous Environmental Educator, she is most passionate about connecting people, especially children, to their natural world. Bobby Sherlock, our camp chef for 2 summers and now one of our relief cooks, is deeply connected with the ocean. He specializes in preparing wild harvest foods, and is otherwise in constant motion surfing, kayaking, sailing, boating, fishing, or pursuing wildlife and landscape photography. Quick and content in the kitchen, he's focused on ensuring everyone is loving what they're eating! Bobby has over 15 years experience in the restaurant industry, and is a graduate of the College of the Rockies Adventure Tourism Business Operations Diploma. WOW! A perfect blend of showcasing this magnificent environment, great food, and just the right amount of 'creature comforts'. You are all amazing hosts redefining hospitality. From our website and pre-trip information to your actual adventure holiday with us, we do our professional best to communicate with integrity, match guests with suitable experiences, and have the right people and systems in place to make it happen in fine form. Our kayaking guides are trained and certified with the Sea Kayak Guides Alliance of BC, Association of Canadian Sea Kayak Guides, Paddle Canada, or as appropriate for the specific program. 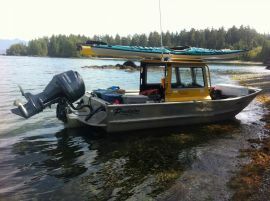 For over 2 decades, we have helped to set safety standards for guided sea kayak tours in BC and Canada. We follow and frequently exceed industry practices for guide-to-guest ratios, safety equipment, contingency options, and certifications, including appropriate first aid credentials and experience. Our team is carefully selected for complimentary skills and how they make decisions: operating within their training and experience, and keeping our guests' safety and enjoyment at the centre of every decision. experience.There is never any pressure to pack up and paddle if the weather or sea conditions are unsuitable - we don't need to move camp, and there are plenty of land-based activity options. With our expedition-style trips we maintain a small overall group size, similarly depart from our established base camp, have access to water taxi shuttles, and can easily alter the trip itinerary as weather conditions dictate. There are many resource layers and contingency options for guest safety in our remote location, including: our staff's training and attitude, established base camp facilities and equipment (including substantial first aid supplies), a versatile power boat, local knowledge and network, many communication options (including VHF radio and satellite phone), and proximity to medical care at the Village of Kyuquot's Health Centre (10 min boat ride from base camp and little to no waiting time).